That's 08, just beginning to bend. 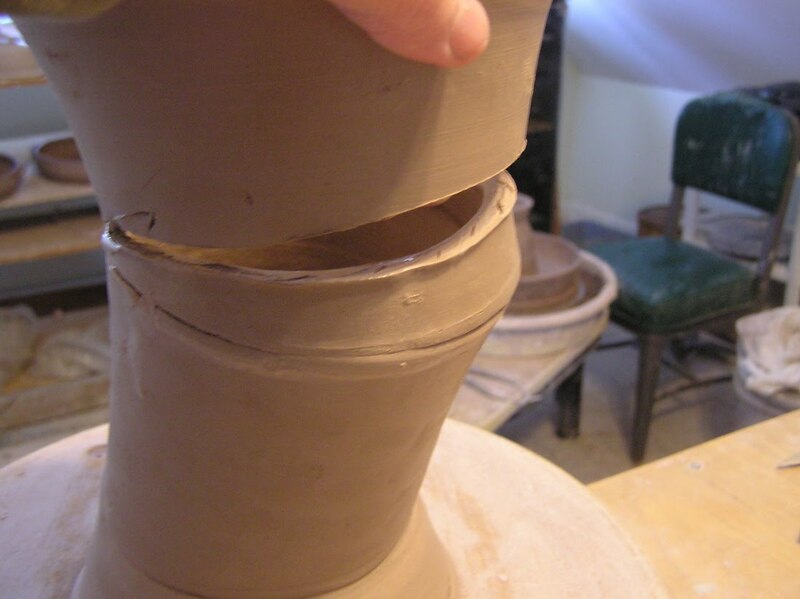 I don't use watch or guard cones in the bisque anymore because, what for? I can tell by the color when it's getting close, and once I know a kiln, the bisque always takes the same length of time, anyway; and even if it overshoots, it's no big deal. I could miss by 3 cones and still be fine. 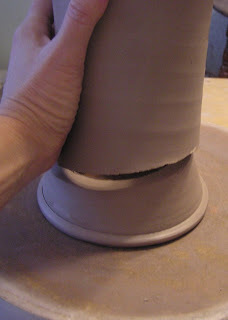 I fire my bisque to the lowest temperature that will not cause problems in my glazing. 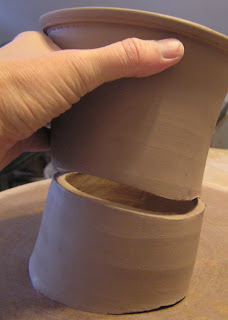 I used to bisque to 010, but then I started using B-mix, with which one glaze blistered and pinholed when bisqued to 010. Not alot but enough to be annoying. A slightly hotter bisque solved that problem. 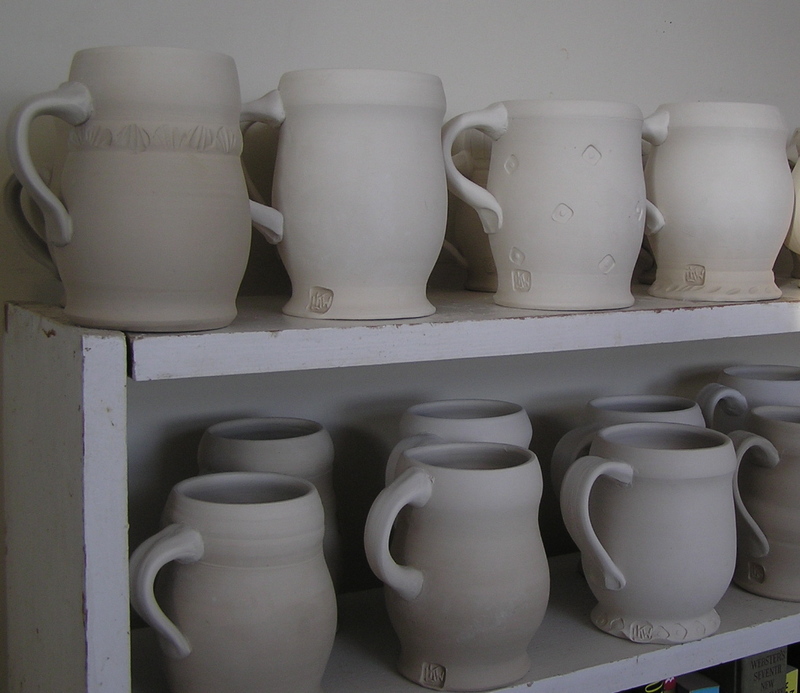 Lots of potters I know bisque to 05, but that seems like wasting fuel -- and for fuel, read "money" -- to me. 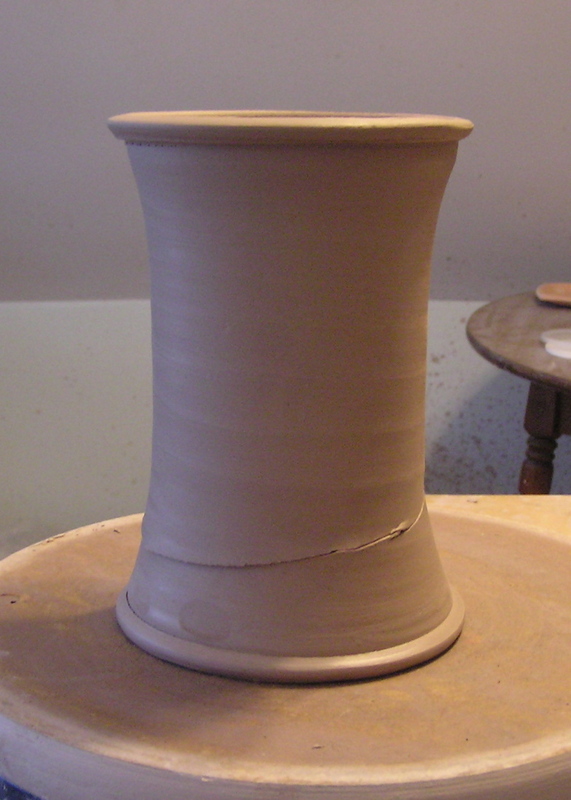 Plus if either of my stonewares gets to 04, the body starts to get too tight to take glazes well, so I have a much narrower margin of error. Anyway. 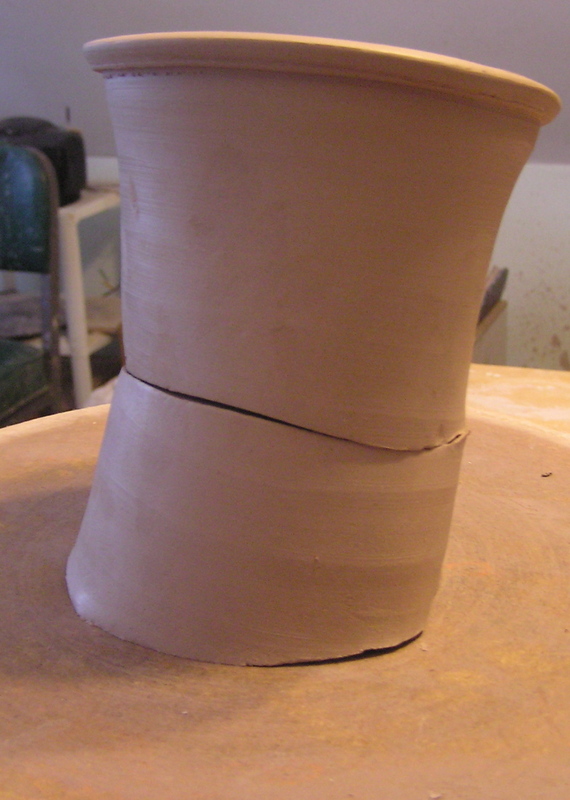 It's climbing fast now, so my cone may be down, even in the time it took to type this. I hope so, because I want to get my PJs on. Someday -- oh, far-off someday, glittering in the distance like an oasis -- when I've got the kiln all figured out, I'm gonna skip firing in the winter, Just pass on it. 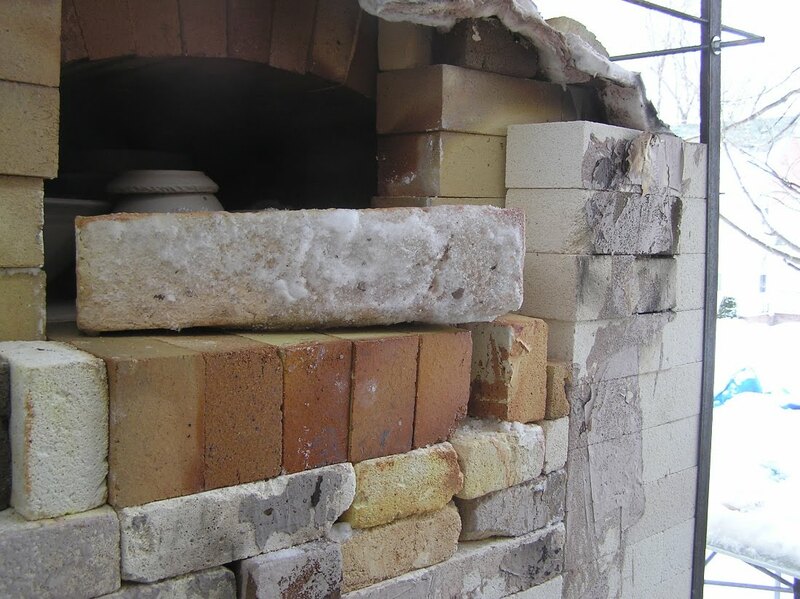 Spend January, February, and March making, making, making, and then fire it in the spring. The rest of the year can be full-cycle. 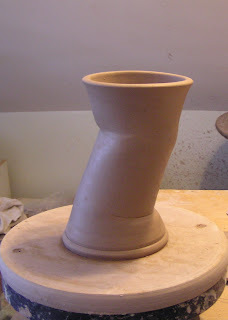 I loaded a bisque this morning, in the snow. It was actually quite pretty and pleasant, exccept for ever-present danger of slipping. So that was all fine until it came time to brick up the door, and I discovered that my blocks were not just under a pretty snow cover, but caked with ice as well; so I had to melt the ice of of each before I could brick up the door. Needless to say this slowed the porceedings down a bit. 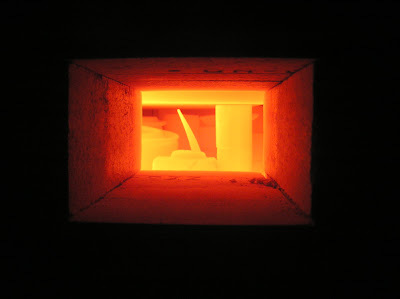 The kiln was candling all the while, though, so it probably won't slow the firing any. 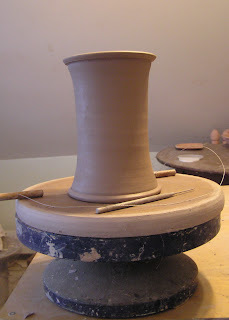 This firing is (as all will be for a while) an experiment; I haven't had the propane refilled since the last glaze firing. That was a super-long firing, and the gauge is at 50, but I certainly hope I can get a bisque out of what remains in the tanks. 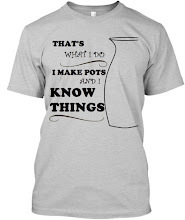 If not, well, I'll have learned something. Will post more photos when the stands are assembled. Not mine, unfortunately. 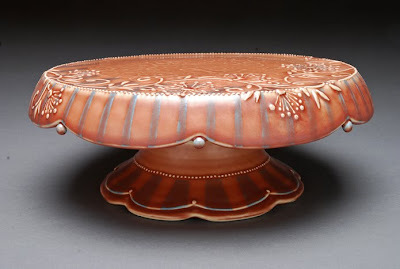 I had cake stands all on my mind, and then this wonderful link arrived in my inbox! 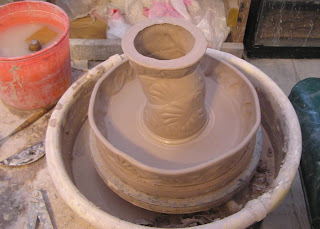 You can see more wonderful pieces at Kristen Keiffer's blog. Go, look, now! It's amazing. 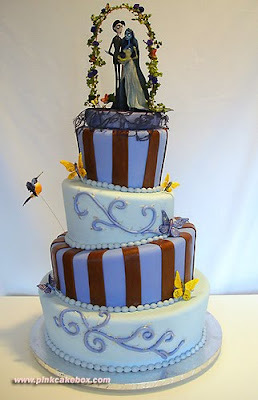 When Doug & I got married in 2006, I sort of got my heart set on a topsy cake for our wedding. He didn't care much -- his wish was that our ceremony include a dip in the river, in our wedding finery, which he got. Also, he's not much of a one for sweets, although a bite of the wedding cake was all he did have to eat that day, as I recall. Anyway, the topsy cake turned out to be crazy expensive, considering our shoestring budget, and my practical side won out. Our cake was chocolate, and lovely, and quite delicious -- but I never forgot the wedding cake of my dreams. Today I am on the studio making, among other things, cake stands. Topsy cake stands to be exact. So, let's see how that topsy thing is workin' out...Not that good, tell the truth! My first effort looks more like one of those novelty mugs reading "I got smashed on Bourbon Street!" or where ever. Not what I had in mind. 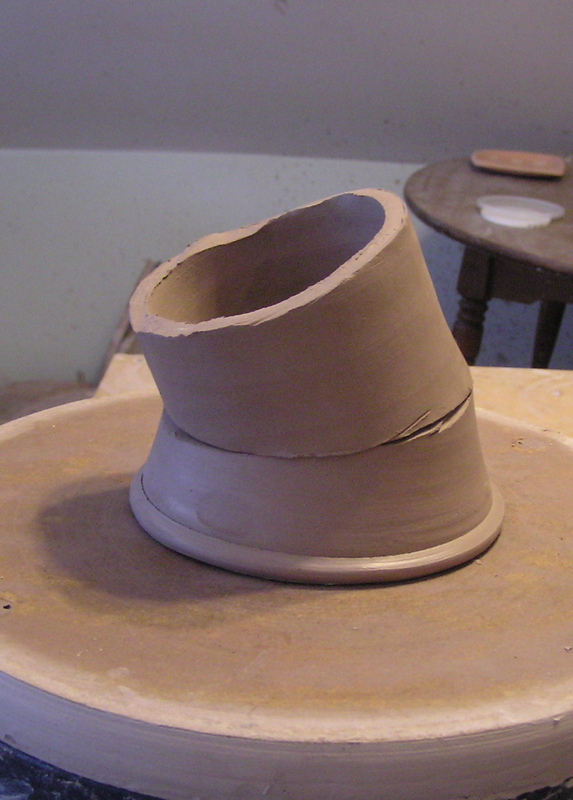 In my enthusiasm, I started too wet, and lost the freshness: an occupational hazard of altered work. 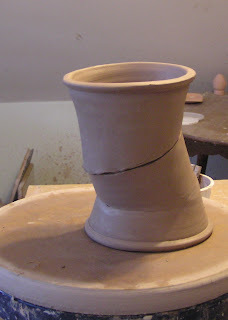 Of all people I ought to know that clay is all about timing! Not that this one is a lost cause, I'll still tinker around with it, add the plate part, see what happens. but it's time to step back, do something else (I'm thinking, get a whoopie pie. I saw some double-chocolate ones at the grocery yesterday, and all this talk of cake...), and come back to the second one once it has firmed up a bit. So, this sort of turned into a live-blog. Live-blogging the cake stands! I like it. 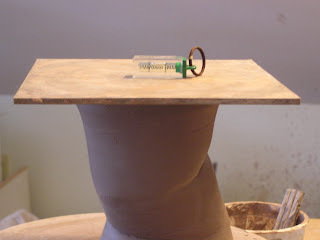 Back later with some better results. It will be entirely consistent with my history with automobiles, if the hearse breaks down on the way to my funeral. I have dreadful car-karma, and it has been manifesting itself with a vengeance this winter. Two major blizzards, two concurrent breakdowns, plus a bum alternator and a minor accident to keep things interesting. Lemons became lemonade during my most recent misfortune, however: my fuel pump quit in the midst of a terriific storm, but fortunately it did so just a couple blocks from Portland Pottery, where I am on the faculty, and where, also, I could not only use the phone to call a tow, and have a warm place to wait, but I could also get clay and use a wheel. And what else was there to do? 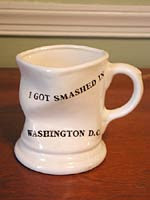 So I made mugs, to fill a recent order from Phil at Bay View Company. In related news, I've been noticing a used Ford Ranger for sale, that I drive by often in my travels. I asked after the cost and found that I almost afford it...and it might be worth to have automotive back up, given my history. 2)Make enough pots to fill a bisque. 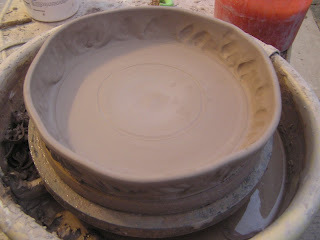 I already have enough bisqueware to fill a glaze firing, but I want to do a glaze first, and see how even it fires to 08. 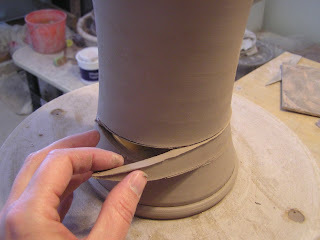 3)Mix up 3 test glazes. Just because I am still tweaking the kiln doesn't mean experimentation should stop. 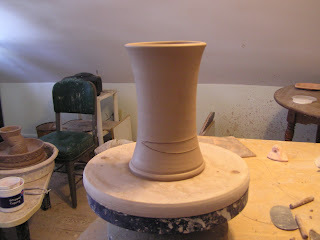 5) Glaze firing prior to the end of the month. Shooting for...Let's say the 21st. I haven't yet completed my annual navel-gazing, during which I plan strategy for Fine Mess Pottery for the next annum. I don't expect it to reveal any surprises, as my path seems clear. That in itself is a good feeling.